Who knew you could have this much fun with One Chip and Two Knobs. There has been a lot of buzz lately about a simple synthesizer circuit that can be assembled from an LM556 Dual Timer Chip and a handful of parts from your junk box. This fun little circuit is known as the Atari Punk Console, and it has taken the circuit bending world by storm. By simply manipulating two control pots, you can make a myriad of beautiful sounds ranging from a smoke alarm dropped into a fish tank, to a jammed dot matrix printer. After seeing the fun people are having with this thing, I knew I had to build one. I dug through my parts bin and a couple of hours later, I was the proud owner of the device pictured above. If you would like to build your own, I would recommend checking out this article from Make Magazine. We're going to talk a bit about what is going on under the hood to make it sound the way it does. 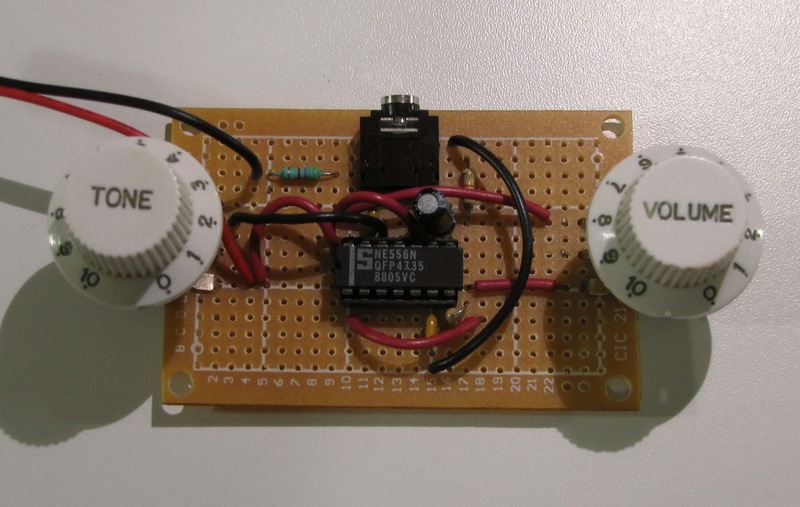 But first, lets look back at this circuit's humble beginnings. Back in the early 70's, a guy with the unlikely name of Forest M. Mims III wrote a series of books for Radio Shack about getting started in electronics. These books were great for beginners, filled with simple projects and super cool hand drawn schematics. I'm sure Mr. Mims was not envisioning the rise of Dubstep when he came up with a project called the Stepped-Tone Generator which he described as sounding like "plucked violin strings" (Really??) Now, a simple Google search will turn up a bunch of sites that will give you this same information. But I defy any of them to whip out their "80's fresh" original copy of the actual book! Bam!! I didn't think so! So how does it Sound? The following video will give you an idea. First, some basic terminology. This circuit is all about Square Waves which are defined as "Waves that alternate regularly and instantaneously between two levels". That's just fancy science talk for a waveform that has a square shape. Waves have a Pulse Width which is a measure of time that the wave is in it's "on" state. And a Duty Cycle which is ratio of the waves on time to it's off time (written as a percent). The heart of this circuit is a LM556 dual timer chip (Basically two LM555 chips in one package). The first timer is set up as a Astable Multivibrator (which is nowhere near as fun as it sounds). This is a fancy name for a circuit that switches between two states automatically. In this case, it generates a square wave with a frequency determined by the potentiometer on the right. Turn the control clockwise, and the frequency increases. Now, you don't actually hear this wave at all. It is simply used to trigger the next timer stage. The second timer in the chip is configured as a Monostable Multivibrator. This is a timer that sits there doing nothing until it is triggered by a low pulse (from the output of the first timer circuit). It will then pulse high for a predetermined length of time. This is commonly called a "One Shot" timer. 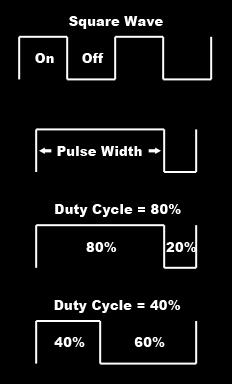 The potentiometer on the left determines the length of time the pulse stays high or the "Pulse Width". 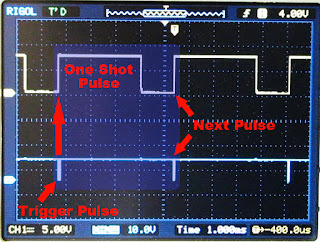 One important note, once the One Shot pulse is triggered, it will ignore further triggers until the pulse is finished. The square wave this second timer produces is the one that is fed to the audio output and the one you actually hear. 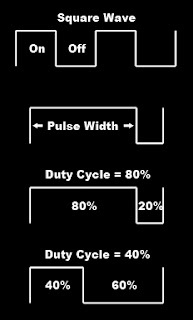 As the frequency of the trigger pulses is increased, the One Shot pulses are triggered closer and closer together causing the pitch of the audio to rise. 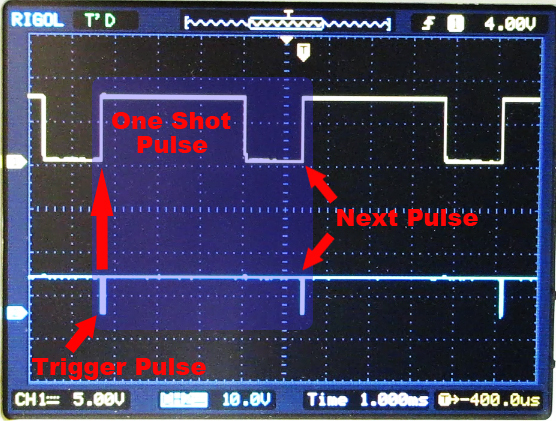 This continues in a nice linear fashion until the point where the trigger pulses become shorter than the Pulse Width of the One Shot pulse. The One Shot will suddenly span two trigger pulses causing the pitch to drop sharply. This pattern will continue as the frequency of the trigger pulses is increased creating a staircase pattern to the sound. Once again, a video is worth a thousand words. Watch the following video to see it in action. Wanna make this... Nice explanation of the workings of the APC.. and nice book! !